Stanley Clarke has been on my list of legends to see live for many years now. This man has accomplished more musically in his life than any bassist I can think of. The lively stage presence, professional grade prowess, and pure loving energy this man radiates at age 66 is not just something to look up to, but is at a level of inspiration that is nearly impossible to find with any musicians in the scene today. Most commonly known for his deep discography in the band Return to Forever, Stanley has worked with many of the most versatile and respected musicians in the music industry. Whenever a band is lead by a bass player (especially one of this caliber) there is a unique strength to the collective groove of the group, but the most valuable perk is the comfort zone that each artist seems to get from a solid foundation and the space to be so openly expressive inside such a tight pocket. Stanley began each song dialing in his bass tone specifically how he wanted it. You could tell when he found what he wanted because he would smile at the drummer and nod in approval to the rest of the bandmates. Stanley’s smile is the most contagious and enjoyable expression you could possibly ask for from the man leading the band. Known worldwide for pioneering his electric slap bass techniques, Stanley displayed his skills along with his seemingly impossible to replicate tone to the audience. He and fellow bandmates in S.M.V. Thunder; Victor Wooten and Marcus Miller, are known not only for their fantastic talents, but for their very unique and specific bass tones. It was incredible to see a man who has worked with arguably some of the greatest talents in music over the last sixty years appear on the stage accompanied by such a young crew of bandmates. Beka Gochiashvili was introduced as 22 years of age, and another keys player of note Cameron Graves, was introduced as a joking “thirty-something” by Stanley. While I am an honest believer that age is no more than a number when it comes to music, the wisdom and experience gap of 44 years between Stanley and the young man behind the grand piano was something difficult to wrap my mind around and truly inspiring to see. 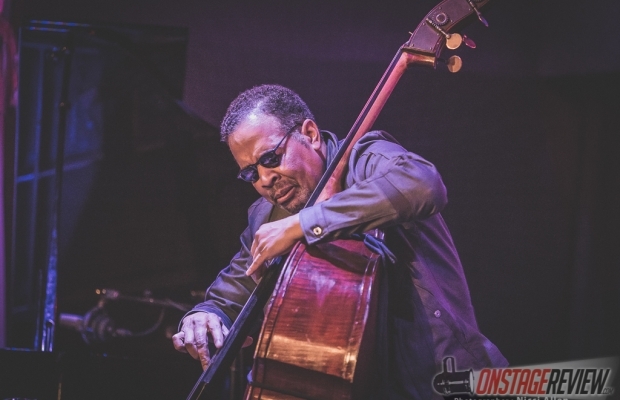 Just as Stevie Wonder and Miles Davis are known for giving young aspiring musicians an opportunity to flourish early on in their careers, Stanley Clarke has teamed up with some absolutely brilliant players. Evan Garr joined in as well, bringing his unbelievable violin skills into the mix for a few tracks. Stanley mentioned that Evan was a musician he found for the Chicago show, but by the way he poured himself into his violin, it seemed like Evan had been planning for this performance his entire life. With each member of the band getting plenty of spotlight to show off their individual skill sets, I can imagine that each of these musicians was handpicked by Stanley Clarke himself. The speed, articulation, and precision of each player was absolutely on point with some of the greatest I have seen at their respective instruments, but the subtleties, emotional expression, and creativity of each member was something entirely on a different level. It was pretty clear that Stanley Clarke chose these players for each of their specific and very unique approaches to jazz itself. Beka had a more playful approach where he would get other members laughing during many of his solos, while Cameron, being rooted in the metal community as well as jazz and hip hop, often took the more aggressive and abrasive approach to his note selection and speed. That being said, the drummer and violinist both had absolutely no problem matching said speed during any exchange. Even though Stanley’s probably got over 60 years of playing under his belt, he too had no issue showing off his ability to shred. On both his electric and stand up bass, this man laid down the groove, masterfully danced around melodies, and absolutely tore into his 4 strings with as much vigor and spirit as he has throughout his entire career. To one of the greatest to ever grace the world with his music; I say thank you, Stanley Clarke. This show was equally as inspiring as it was a wake up call for me to get back in the shed and work on my own musicianship. Bravo gentlemen, bravo.